A "slit lamp" is a special kind of microscope that eye doctors use to get a closeup look at your eyeball. Recording digital images through a slit lamp is useful, but it has traditionally been a difficult task to do well. Although there are commercially available solutions, they are expensive and only work with a handful of digital cameras. 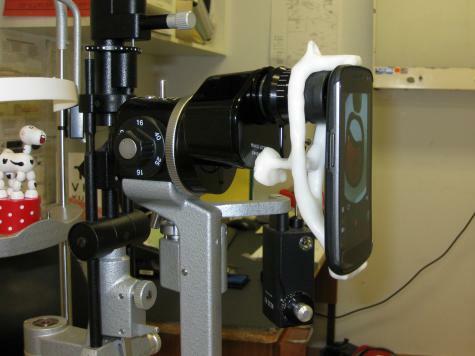 "W" has been using a cheap and ingenious solution: a Plastimake mount to attach a camera phone directly to the slit lamp. Although this example is specific to slit lamps, you could use the same idea to mount a camera to many other microscopes or telescopes. W will be giving a presentation on this concept at the national eye conference in November.